(Hey! Don’t start here!! Start with the first part of this article. When we last met, we discussed the excellence of the pastrami sandwich available at Manhattan’s Second Avenue Deli and Katz’s. If you’ve let a week go by without one of their sandwiches, there’s still time to correct the error of your ways. With David Sax as our guide (see his book, Save the Deli), we first travel to the Bronx for “hush puppies”–little hot dogs wrapped in potato–at Liebman’s, which carries a full New York deli menu, and continues a generation-old tradition. It’s a neighborhood place, worth the easy trip from Manhattan. Then, not so far from Yankee Stadium, there’s Loeser’s, a comfy old fashioned place that David describes in his blog. In Queens, the queen is Ben’s (with restaurants on Long Island and Manhattan), but neighborhood places like Buddy’s remain. Knishes from Knish Nosh in Queens (and now, in Manhattan, too!). They don’t get much better than this. While in Queens, there is one place where you must eat. It’s called Knish Nosh (for the uninitiated: a Knish [KUH-nish] is a large baked dumpling, and Nosh is casual eating, nibbling–the noun form would be a nosh, and the verb form, noshing). Few may disagree, but this is probably the place to buy the best knishes in New York City (maybe even the world). Potato or kasha would be the purist’s choice, but mushroom, mushroom/carrot, sweet potato, and spinach would also score on a top knishes list. And–who knew?–there are now Knish Nosh outposts near Central Park and 106 Street, near CitiField (where the NY Mets play) around Flushing Meadow Park, and in Florida, too. In Brooklyn, where there may have been as many kosher delis as churches, choices are few, but the few choices are good ones. There’s Adelman’s, a throwback to the era when Brooklyn might have been the center of the world, and here’s a rundown on the others–with pix of tasty sandwiches. 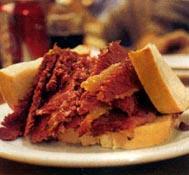 A good home-cured corned beef sandwich served in Newark, NJ at the long-running Hobby’s. Across the Hudson, Hobby’s Deli is all that remains of a once-grand tradition in downtown Newark. 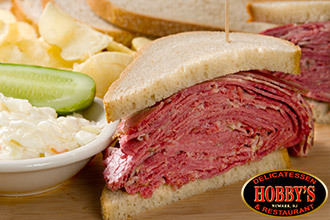 It’s favored by the city’s power elite, quite the place to meet friends and business associates while enjoying a corned beef or pastrami sandwich. In northern New Jersey, it’s Eppes Essen in Livingston, and others celebrating the old style, often with a more generalized deli menu alongside the kosher favorites. Outside of NYC and its suburbs, demand is lower, so options are few. Philadelphia has Famous 4th Street, and Baltimore, Attman’s, where you can enjoy a terrific sandwich and then wander by the Inner Harbor or Fell’s Point, both nearby. Old-style delis are famous for pastrami and corned beef, chicken soup and kneidlach (matzo balls), but there’s nothing quite like a kosher hot dog. In fact, there’s a wonderful category of Jewish sausages–frankfurters, “specials” (fat hot dogs), Kosher bologna, Kosher salami (soft or, for connoisseurs, the garlicky hard version). Here’s Nate N’ Al’s take on the simple dog. So it’s off to Las Vegas, where the casino outposts of the Carnegie and Stage Delis smell as sweet but taste nowhere near as good as the NY originals, and then, down the road to nearby Henderson, where New Jersey’s Michael Weiss takes the craft seriously, and “pickled his own corned beef and tongues, cured and smoked his own pastrami, and baked his own bread and pastry,” according to Sax. The result is deli magic. Deli done right. Worth a trip just to rediscover the roots of this fading cuisine. Houston is home to “a traditionalist succeeding jun a modern market”, Kenny and Ziggy’s, where “the giant noodle kugel [pudding] had the consistency of a soufflé.” Watch them on Food Network. Outside the U.S., three delis belong on every foodie’s bucket list. The first is Schwartz’s in Montreal, where the smoked meat sandwich more or less combines all that is sacred about corned beef and pastrami. Here, the spectacular sandwich begins as “raw brisket from Alberta” which is then “rubbed with a mixture of coarse salt, cracked peppercorns, and Schwartz’s special spice mix, which involves much less sugar than a New York style pastrami, with more pepper and fewer aromatic spices. Briskets are then cured in plastic barrels for a…week…ready to enter the smokehouse…stained with burnt fat and old spices…[where they] smoke for five to seven hours…” (While in Montreal, be sure to sample the uniquely sweet, smallish, delicious bagels from St. Viateur. The second must-visit is to B&K Salt Beef Bar, home to “stupendous” chopped liver (made from ox, not chicken, as is the US tradition), followed by a sandwich of either hand-cut tongue or salted beef, cured for a remarkable two-and-a-half weeks. Both are made with good Scotch beef, and that makes all the difference. The third diverges from the peasant food history. It’s located in Antwerp’s diamond district. Hoffy’s treats delicatessen as fine food, with small portion sizes (take that, Carnegie Deli!). Start with the pickles, which are always difficult to get right. In New York delis, the brine must contain the right balance of salt, dill, garlic, and other herbs and spices–otherwise, they just don’t taste like sour pickles or, with a different recipe, half-sours. Here at Hoffy’s, the focus is on the garlic, and the flavor soars. Meats are lean (never the case in a New York deli), extremely tender (similar to NY deli), and according to Sax, the best is the veal–a meat not often associated with NY deli–“creamy pink and tasted almost sweet.” Portions are small, and elegant: bite-sized portions of stuffed cabbage, gefilte fish, chopped liver, and apple kugel. There are so many Jewish specialities, so many variations, such unique flavors and delicacies, each wrapped in years of tradition. Blintzes and lox, the bialy and the plateful of rugeluch; the mushroom barley soup and latkes. But the tradition is fading. The people who opened the delis came from an Eastern Europe that no longer exists. There will be no more Jews with the old traditions emigrating from Poland or Lithuania or the Ukraine. They’re gone. There are fewer Jewish neighborhoods to support the delis–the people who used to live, in great (but poor) communities, in Brooklyn or lower Manhattan now live with everybody else. The small delis can no longer support themselves–except in areas where the tradition lives strong, as it does, largely due to the Jewish show business community, in Los Angeles. And yet, this is a cuisine worth nurturing, worth embracing. How? I guess that’s why Sax calls his book Save the Deli! Without a concerted effort, the few remaining delis will be gone, and with them, a great cuisine may vanish, or, perhaps worse, may be reduced to Nathan’s hot dogs, Einstein’s bagels, and the occasional frozen knish. Long may it wave! A corned beef sandwich from Attman’s in Baltimore, founded 1915. Will they survive the next 100 years?